Sometimes you just have a super-original, killer headline, and you wait all year for the story to go with it. Above and below is Finnish artist Eemil Karila’s Surface Values, currently installed in Program, an architectural project space in Berlin. 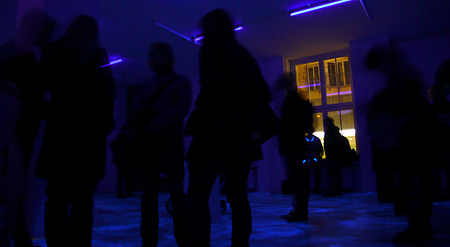 The typical austerity of the white exhibition space is shifted in this installation by the periodical switch from standard white neon lighting, to ultra violet black light. 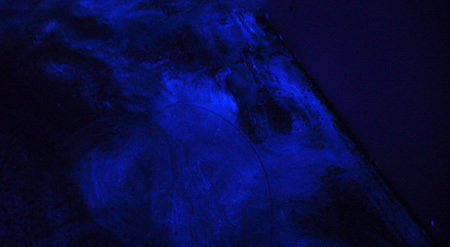 The swirling forms on the floor are the traces of UV ink mixed into the cleaning fluid of the gallery’s cleaning lady. Vernissages are peculiar things at the best of times, but the opening night of Surface Values was particularly disorientating. On opening nights the art in question is of little importance. It must take second place behind the social gathering in which communication is reduced to a blur of distracted introductions punctured by neurotic who-else-is-here gazes over shoulders. What was interesting here though, was the same thing that eventually drove me out of the place: the room was making me feel terribly ill, and the single bottle of beer I had drunk, felt more like ten.